Floral Expressions proudly serves the Lincoln City area. We are family owned and operated. We are committed to offering only the finest floral arrangements and gifts, backed by service that is friendly and prompt. Because all of our customers are important, our professional staff is dedicated to making your experience a pleasant one. That is why we always go the extra mile to make your floral gift perfect. Melanie has over 30 years of floral experience. 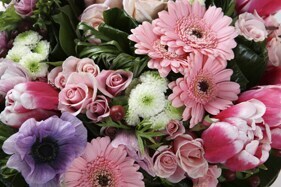 Make Floral Expressions your first choice for flowers. We are available for all your floral needs from 9:00 a.m. to 5:00 p.m., Monday through Friday and from 9:00 a.m. to 2:00 p.m. on Saturday. Closed on Sunday. To help assure on-time delivery during the busy holiday season, place your order at least 1 day prior to the following major holidays: New Year's Day, Valentine's Day, Mother's Day, Memorial Day, Father's Day, Independence Day and Labor Day. Deliveries are not available on the following major holidays. Thanksgiving Day, Christmas Day, and Easter. Melanie has over 30 years of experience in floral work. She operated her own shop in Cannon Beach for 13 years and worked for Ashley Floral here in Lincoln City for another 13 years. She is also a Chamber member and personally customizes every order. Melanie offers consultations with Brides for Wedding Flowers to ensure their special day is filled with an abundance of floral beauty. We accept Visa, Mastercar, Discover, and American Express. If you have any questions or need more information, please contact us by e-mail at floralexpressionslc@gmail.com or call us directly at (541) 921-1167. We're always here to serve you and make your flower-sending experience a pleasure. You can also contact Melanie through The Eventuary in Lincoln City. Our shop serves the following areas in Oregon: Lincoln City, and Taft. We also deliver to Otis, Neskowin and Gleneden Beach for an additional fee. The following are available upon request and advance notice may be required.